“We always recycle! We love what you do! Thank you for doing such a great job!” The staff of Emmet County Recycling (ECR) hears these kinds of things every day and much of that sentiment can be attributed to Elisa Seltzer, longtime director of the county’s Department of Public Works (DPW). Seltzer, who spearheaded the development of ECR into the locally-popular and nationally-prominent program it is today, is moving on after three decades. She leaves a legacy of solid programs and many new developments in the works. Seltzer’s accomplishments serve every Emmet County resident and business nearly every day. Over 80 percent of county households recycle their paper, cardboard, and containers. Garbage disposed of in the county flows through the Solid Waste Transfer Station she has overseen since 1990. Her accomplishments reach far beyond Emmet County though. Emmet County Recycling program has had a profound impact on recycling throughout the “tip-of-the-mitt” region. The popularity and growth of the program provided leaders in neighboring counties with a thriving example of rural recycling. ECR’s materials recovery facility (MRF) processes and markets recyclables from Cheboygan, Otsego and Presque Isle counties under contract. This partnership provides efficiencies of scale for all of the communities involved and creates a competitive market for municipal recycling services. As the popularity and growth of the Emmet County recycling program showed what is possible, Seltzer came to be looked to as an expert statewide. She serves as chair of the Networks Northwest Solid Waste Advisory Committee, served two terms on the board of the Michigan Recycling Coalition (MRC) and served on the nine-member Governor’s Recycling Council under the Snyder administration. 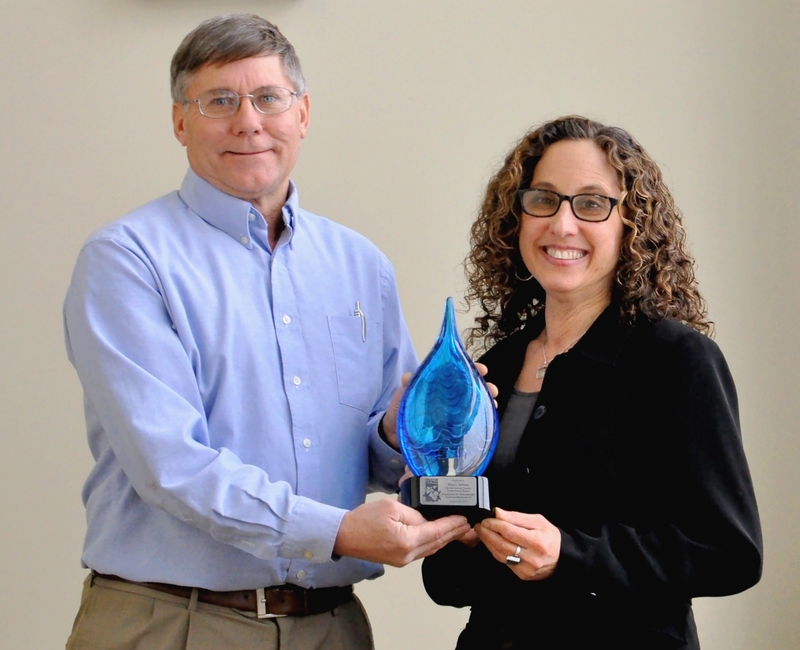 Seltzer was the recipient of the MRC’s Recycler of the Year Award twice and received the Northern Michigan Environmental Action Council’s 2017 Environmentalist of the Year Award in the public service category. The Emmet County program received an MDEQ Recycling Leadership Award in 2015 for excellence across all their award categories. When asked how Emmet County does it, Seltzer has often framed her approach as making the program “convenient, comprehensive and cost-effective.” In 1992, Seltzer and her team expanded the county’s recycling drop sites from two to 10, putting every county resident within six miles of a site. Since 2004, ECR has operated curbside recycling collection under contract with five townships and municipalities comprising 60 percent of county residents. In 2017, Alanson became the latest municipality to offer the service to their residents. Facilities were upgraded and/or expanded to improve sorting and storage efficiency a half-dozen times during Seltzer’s tenure. Employees supported by the programs expanded from four to nearly 30. In recent years, recycling has saved Emmet County residents and businesses roughly $1.25 million a year in garbage disposal costs and sale of collected materials has brought in as much as $1 million dollars a year to fund the program. The kinds of materials accepted for recycling have also grown constantly under Seltzer’s leadership, from just newspaper, cardboard, motor oil and batteries in 1990 to 62 materials today. Notable increases came with the addition of bulky-recyclables (tires, construction and demolition materials) and yard-waste-composting areas in 2006, a new MRF accommodating plastic bags and cartons in 2010 and food waste composting in 2015. ECR’s Pleasantview Road Drop-off Center is considered one of the best in the Midwest. Additions over the last decade have included a year-round collection of electronics and mattresses, as well as latex paint recycling. As the programs built upon each other, the results brought national attention to the Emmet County recycling program. Seltzer presented at the 2017 Resource Recycling Conference in New Orleans and then at the Solid Waste Association of North America’s WasteCon2018 in St. Louis, Mo. Emmet County Recycling was recognized in the National Recycling Coalition’s Outstanding Government Program award category in 2017. Seltzer points to the policy framework that supports it all as another key factor in Emmet County Recycling’s success. In 1991, the Board of Commissioners passed the county Solid Waste Ordinance which was rapidly adopted by 17 of 21 county townships and municipalities. The ordinance incentivizes waste reduction and recycling and creates a level playing field to prevent anyone waste hauler from establishing a monopoly. The DPW has been self-supporting, without county general-fund tax dollars, since 1992. Seltzer’s policy of designing recycling systems to produce high-quality materials for factories has allowed ECR to “recycle local” with 95 percent of the materials recycled through ECR supplying a Michigan business. At the same time, it has increased recycling revenues – which pay the largest share of the recycling program’s expenses – and helped the DPW weather downturns in markets for recyclables, like the 2018 shock to U.S. markets caused by China’s ban on imports of all but the most-pure recyclable commodities. A community open house in celebration of Seltzer’s exceptional contributions to the county and region is planned for Monday, Feb. 11, from 5-8 p.m. at the Back Lot in Petoskey. In a January 2 letter to the Board of Commissioners, Seltzer thanked the members and expressed her appreciation to Little Traverse Township Supervisor Bill Dohm, who led efforts to allow the DPW facility to be sited in his township, and long-time DPW Board chair Denny Keiser, Supervisor of Bear Creek Township.